AirBake brand has always been "The Original Insulated Bakeware". AirBake continues to provide the best baking results every time. Made of 100-percent natural aluminum, AirBake provides an overall enhanced baking performance with its insulated aluminum sheets and micro-dome technology to decrease bake times by up to 15% over traditional insulated bakeware. Two heavyweight aluminum sheets surround a layer of air. The air reduces the temperature of the metal that comes in contact with the food. The bottom sheet blocks the direct oven heat while the layer of air acts as an insulator preventing the top sheet from overheating. This means better browning, no burning, and moister baked goods. Set includes 3 cookies sheets (14x9, 14x12, 16x14). CARE INSTRUCTIONS: Before using your bakeware for the first time, wash and condition the bakeware by spreading one teaspoon of cooking oil over the interior with a clean cloth. Wipe off any excess. Avoid overheating your AirBake bakeware. In order to preserve and avoid scratches on your coating, we recommend the use of plastic utensils. Slight surface marks or abrasions are normal and will not affect the performance of the non-stick coating. With use, the non-stick surface may become slightly darker. This will not impair its performance. AirBake is designed to breathe and is not watertight. However, AirBake is dishwasher safe. DO NOT USE DISHWASHER DETERGENT TABS - the concentrated cleaning agents will damage the bakeware's finish. DO NOT SOAK - if water is inside pan layer, there is a risk of burning from steam release. If your pan has water inside the two sheets, place the pan upside down in a 250-degree oven for 30 minutes or until water is removed. T-Fal AirBake Cookie Sheet Set -- 3 Sheets (14x9, 14x12, 16x14). AirBake is the original insulated bakeware since 1933. High quality, durable AirBake cookie sheets. Micro-Dome base bakes 15% faster. AirBake natural aluminum -- guaranteed not to rust. The AirBake bottom sheet blocks the direct oven heat while the layer of air acts as an insulator preventing the top sheet from overheating. 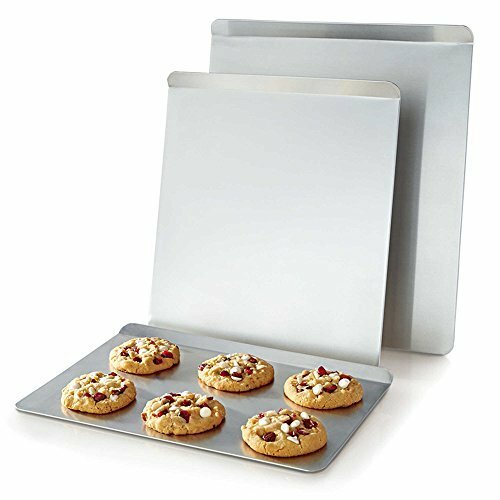 This AirBake cookie sheet set is the perfect gift for anyone who love baking! If you have any questions about this product by AirBake, contact us by completing and submitting the form below. If you are looking for a specif part number, please include it with your message.